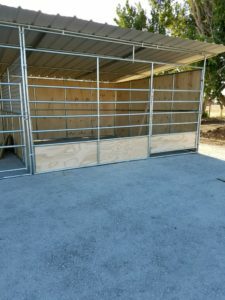 On July 26th, our stalls were delivered to LoneStar Riding Academy. They started installing them the next day and finished about a week later. 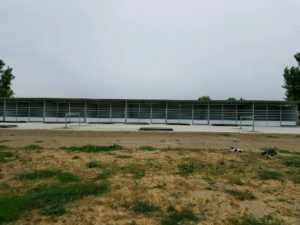 There are still a couple finishing touches that need to be done by Corral’s R Us, but for the most part the stalls are ready for horses. Heidi ordered the stall mats and bought the paint a few days after the stalls were put up. She has painted all the exposed wood inside each stall and will paint the exterior walls as well. Stall mats are being moved in slowly. Now for the stall design! 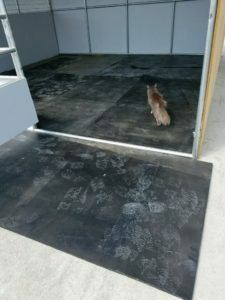 Our 9 stalls are 16’ x 16’ fully matted. 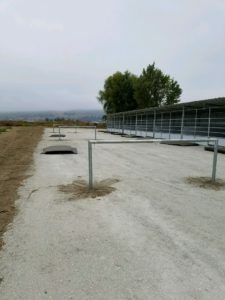 The fronts are open 5 rail pipe panels with 2’ of plywood at the bottom to reduce the waste of hay and to prevent horses from sticking their heads out between the bars. The gates are 7’ wide also containing 2’ of plywood at the bottom to also help prevent the loss/waste of shavings. I absolutely love the wider gates which allow for horses to enter while saddle and to avoid stirrups getting caught as the stall is entered. Each stall divider is 8 feet high. There is 4’ of plywood on the bottom and 4’ of 2” x 4” welded wire on top of the pipe panel. The wire allows the horses to see each other all the way down the row, but prevents horses from “getting” to each other. It also allows good air circulation between and around each stall. We have opted not to use automatic waters at this time, as I want to be able to monitor water intake of my training horses. Water buckets will be cleaned at least once a week (unless a horse is a hay dunker). There are also 3 10′ tie rails mats, every 3rd stall. We are offering full care boarding to students and clients looking for training, with a few stalls open to the public. We are a small private facility that wants to stay drama free. There will be a few other services available for an extra fee! Are you ready to join us at a low key, well cared for facility? Looking for lessons or training? Would you like to join our show team? Contact us today about our availability!